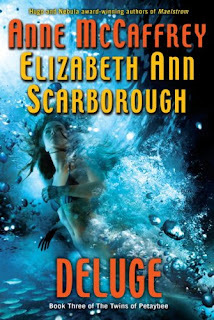 The mass market paperback copy of "Deluge: Book Three of The Twins of Petaybee" by Anne McCaffrey and Elizabeth Scarborough will be released March 24, 2009! Over one year after the original publication of the Hardcover version but well worth the product of two talented authors working collaboratively...and of course the affordability. "In Powers That Be, Power Lines and Power Play Anne McCaffrey and Elizabeth Ann Scarborough told the story of a sentient planet, Petaybee. Now they have returned to Petaybee and introduced the reader to Ronan and Murel, twins who can transform into seals and converse telepathically with the creatures of Petaybee. Ronan and Murel have left Petaybee on a mission to help rescue their friend Marmie, who has been falsely arrested on the orders of a corrupt Colonel. However, they end up being imprisoned themselves and taken to the Gwinnet Incarceration Colony. There they have to try to evade the clutches of their old adversary Dr Mabu, an unscrupulous scientist who wants to study their unusual shape-changing ability, and doesn't care how much pain her experiments cause them. Meanwhile, the powerful and avaricious Company is making another attempt to take over the world of Petaybee for its resources, and the twins' parents, Yana and Sean, along with the entire planet, must fight to survive..."
If you haven't read Changelings (Book 1) or Maelstrom (Book 2) I highly suggest obtaining copies and reading them in anticipation for this release. Well worth the time and money invested in this collection!